What's wrong with the US food system? Why is half the world starving while the other half battles obesity? Who decides our food issues, and why can't we do better with labeling, safety, or school food? These are complex questions that are hard to answer in an engaging way for a broad audience. But everybody eats, and food politics affects us all. Marion Nestle, whom Michael Pollan ranked as the #2 most powerful foodie in America (after Michelle Obama) in Forbes, has always used cartoons in her public presentations to communicate how politics—shaped by government, corporate marketing, economics, and geography—influences food choice. Cartoons do more than entertain; the best get right to the core of complicated concepts and powerfully convey what might otherwise take pages to explain. 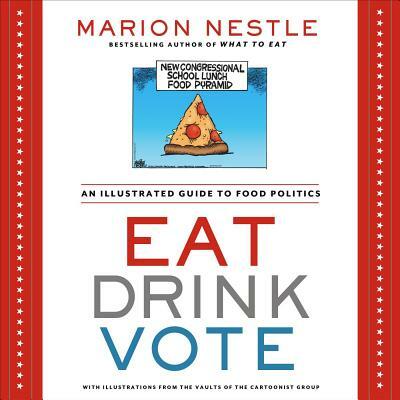 In Eat Drink Vote, Nestle teams up with The Cartoonist Group syndicate to present more than 250 of her favorite cartoons on issues ranging from dietary advice to genetic engineering to childhood obesity. Using the cartoons as illustration and commentary, she engagingly summarizes some of today's most pressing issues in food politics. While encouraging readers to vote with their forks for healthier diets, this book insists that it's also necessary to vote with votes to make it easier for everyone to make healthier dietary choices. Marion Nestle is Paulette Goddard Professor in the Department of Nutrition, Food Studies, and Public Health at New York University. She is the author of three prize-winning books: Food Politics, Safe Food, and What to Eat. She writes a monthly Food Matters column for the San Francisco Chronicle and blogs daily at FoodPolitics.com. She lives in New York City. The Cartoonist Group licenses the work of more 50 leading cartoonists to Web sites, newsletters, magazines, and books, including nine Pulitzer Prize winners.